Developed to meet the nutritional needs of cats aged over 12 months old, Whiskas 1plus Lamb is a wholesome and complete dry cat food. Containing fresh lamb and vegetables, this kibble is also enriched with a variety of eΒential minerals and vitamins that help to keep your cat healthy. This balanced dry food also contains tasty nuggets, which are crunchy on the outside and have a delicious filling on the inside! Whiskas 1plus Lamb contains a high content of vitamin A, which helps to strengthen your cat's eyesight. The texture of this dry food also helps to promote healthy teeth and gums, as tartar is prevented from forming due to the kibble's gently abrasive effect. This dry food helps to keep your adult cat healthy and full of vitality, while also helping to support healthy urinary function and the prevention of urinary conditions. 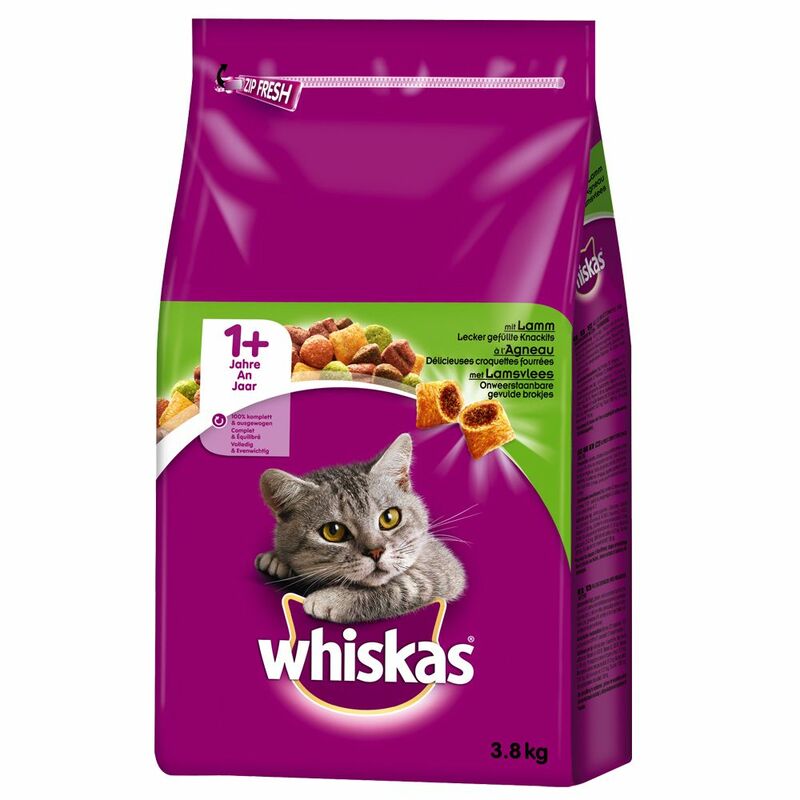 By choosing Whiskas 1plus Lamb for your cat's mealtimes, you are offering your cat everything they need to lead a long and happy life. Whiskas 1plus Lamb at a glance: Complete, dry food for adult cats aged over 12 months old Tasty filled nuggets: crunchy on the outside, delicious and soft filling on the inside Keeps teeth clean: the gently abrasive effect helps to prevent tartar forming Promotes urinary tract health: helps to support healthy urinary function and to prevent urinary conditions from developing Healthy eyesight: the high content of vitamin A supports your cat's vision High-quality and healthy ingredients offer balanced nutrition for your cat No artificial flavours In a practical resealable bag, which ensures that the kibble stays fresh for longer Please be advised: the images of the products on our site are for illustrative purposes only and actual packaging may vary.